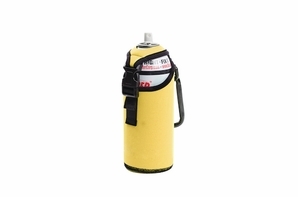 This neoprene holster with a side-release composite buckle holster is commonly used with water bottles, spray paint cans, and other aerosol spray cans. The adjustable strap allows the holster to conform to the size of your water bottle and comes with a 7-70 mm aluminum carabiner. The neoprene holster includes an adjustable strap that conforms to the size of many water bottles and aerosol spray cans.